Windows - Who manufactured these Windows? They are lovely! Hi Stefani, We would love to feature these images on our blog, please email me at social@milgard.com for this free opportunity. faucet - What is the brand of this faucet and where can buy one? what color is the grout on the tile and what color is the window trim painted, please? thank you! Cabinets - Are these full overlay cabinets? Or inset somehow? Thanks! Really?? I contacted Rejuvenation about a month ago and specifically asked if I could use these latches on overlay cabinets and they said no! I may have to order some and try it out. Thanks for the info. Consult a custom cabinet designer, they are better equipped to answer those questions! Kitchen window box horizontal surface - Hi Stefani - Beautiful Kitchen! And thank you for being so willing to answer so many questions. What surface is in the kitchen bay window (i.e. what are the plants sitting on top of)? Did you continue the counter or something else? The lower surface of the bay window is wooden and painted out to match the window casing. We vacillated on this treatment because of durability, but in the end decided that other material transitions were going to look awkward and it was important to the homeowner that it was seamless. However the semi-gloss finish of the trim makes it easier to wipe down. Thank you Stefani. That's exactly the conversation we are having too. I think the wood might be the best looking option too. The kitchen is beautifully done! The countertops are honed statuary marble. Where is the amazing hex floor tile from? Cle tile... So glad you like it! Can you tell me which finish is on the Waterstone faucet? 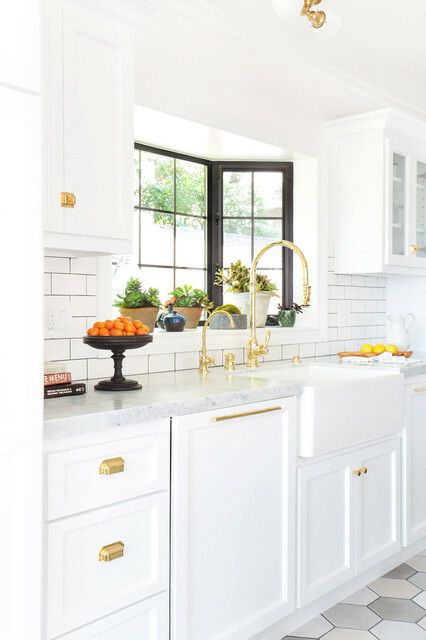 kitchen tile and grout color - Could you share the name and size of the subway tile and grout color used in this kitchen? Very much appreciated. Thank you! Is this the 5500 or 5600 Waterstone faucet? Water stone Faucet - What finish is the faucet done in? Who makes the Farm sink and do you know if they make a dual bowl? Cabinet Hardware - Could you please tell me who makes the cabinet hardware? I'm from LA, would also love to know where to buy. Thanks!